To help you choose between two of the best nail polish brands, we pitted them against each other in a series of tests. OPI Nail Polish was able to eek out a victory and is our recommendation as the best nail polish brand. Nail polish, in some form, has been around since about 3000 B.C. and modern nail polish was developed in the 1930’s. Wondering what all those terms really mean and what the difference is? So were we, so we did some research and found out that there is actually a great deal of debate as to the difference between lacquer, enamel, and polish. Some companies say that lacquer and enamel last longer than polish, yet others say that they are identical. Without an industry standard defining the difference, companies are able to call their products whatever they wish. From a practical standpoint, consider lacquer, enamel, and polish to be the same product. They are all a nail color which is painted onto your natural nails and does not require any special curing process. Gel and acrylics, however, are indeed different from each other and from polish. Gels are brushed onto nails in much the same way as standard nail polish with a base coat, color coats, and top coat. The difference with gel is that each coat must be cured or hardened under an LED or UV light for 2-3 minutes. Gels appear similar to standard polish, however they are stronger and last longer (up to 14 days). Acrylics are artificial nails created by application of a liquid monomer and powder polymer. Together these ingredients harden to form a transparent layer over your natural nails. Nail polish is added on top of the acrylic base. Although there are many nail color options on the market, nail polishes have been around the longest and are the easiest to apply and remove. essie nail polish, ballet slippers, pink nail polish, 0.46 fl. oz. To select the top two nail color brands, we considered their presence in nail salons, increasing popularity, positive online reviews, and featured articles. The two brands which came to the top of the list were Essie and OPI. Essie is the go-to nail brand for beauty professionals, industry insiders, celebrities and fashion icons around the world. With high-quality formulas, fashion-forward nail polish colors, and iconic names, OPI’s heavily-pigmented Nail Lacquers are super rich, long-lasting and chip-resistant – with up to seven days of wear time. Once we chose the brands, we had to choose the specific type of nail coloring to compare. We elected to review nail polishes/lacquers since they are the most popular. Each brand of nail polish comes in a wide variety of colors which can make comparison difficult. To mitigate this, we decided to go with black as it is a more universal color. We used “Licorice” by Essie and “Black Onyx” by OPI. 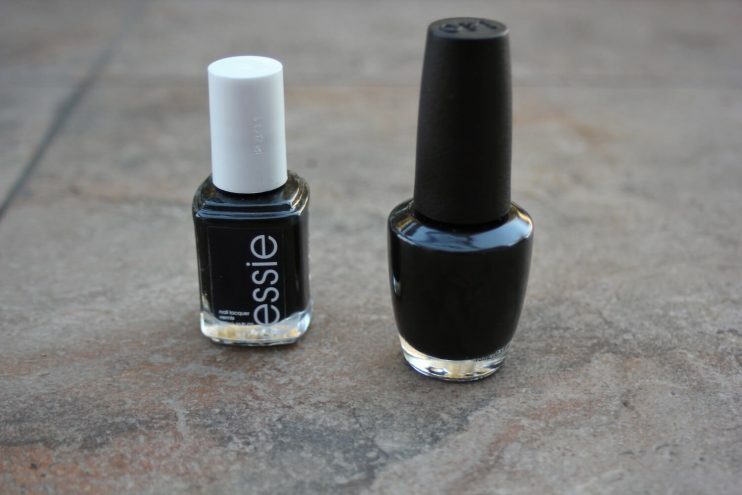 As far as price goes, for the black nail polishes which we compared, Essie and OPI were nearly identical. For different collections/types of polish, pricing may vary. Despite some differences in bottle shape and handle height/color, our first impression was that the polishes themselves looked virtually identical. 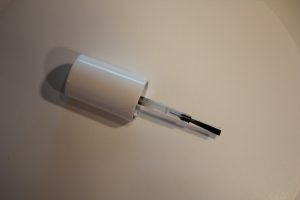 Size: At 15 mL/0.5 fl. 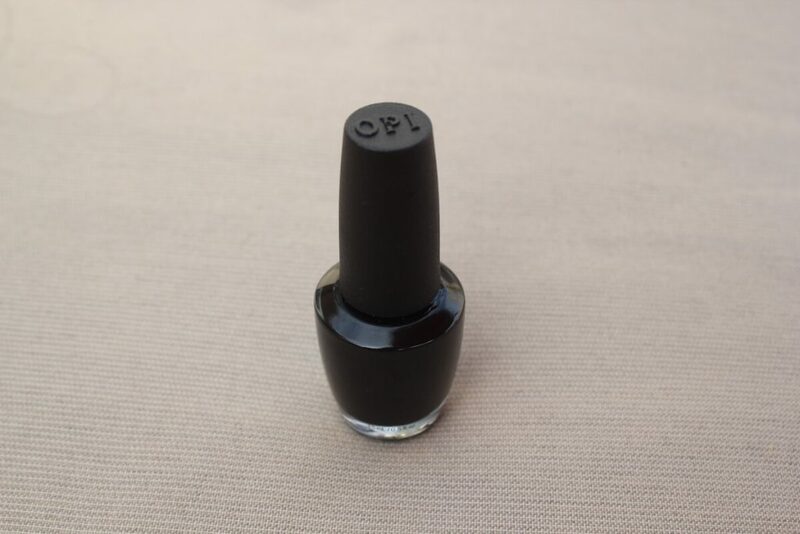 oz., the OPI bottle is slightly larger than the 13.5 mL/0.46 fl. oz. Essie bottle. 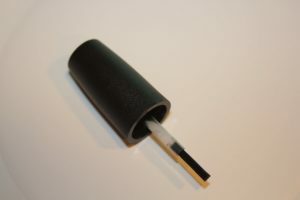 Applicator handle/brush: The handle is larger on the OPI bottle and the brush is wider and flatter. In contrast, Essie has a smaller, shorter handle and a narrower, rounder brush. Ingredients: The ingredients for OPI polish are listed on the bottle. Essie does not include ingredient listings on their bottle, however they are available online. 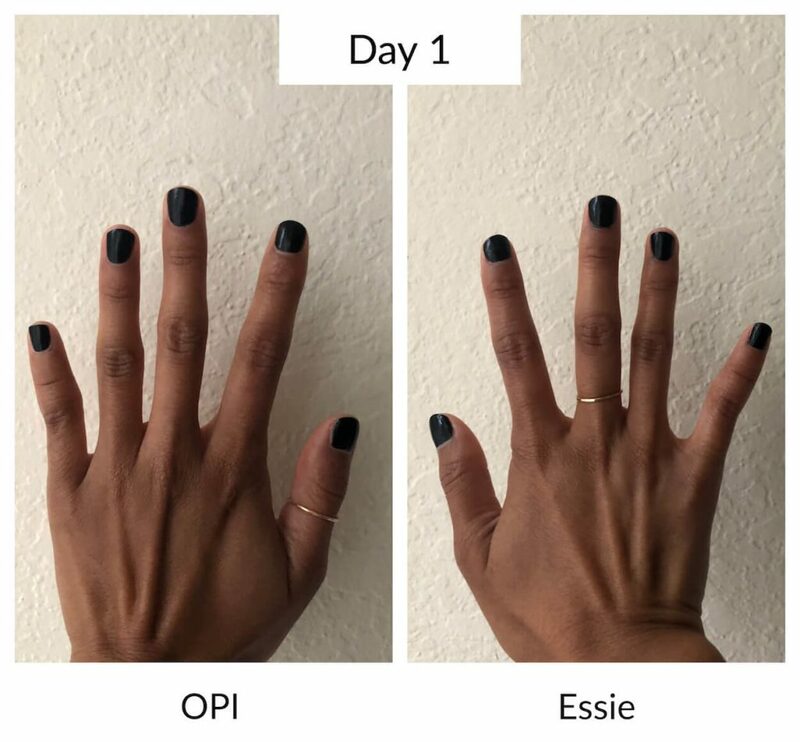 The OPI polish contains fewer potentially harmful ingredients than Essie, and OPI has received a better health safety rating from the Environmental Working Group (EWG). When testing our nail polish we focused on two of the most important success factors for a DIY manicure: ease of application and polish longevity. If a nail polish isn’t easy to apply, it can not only be a frustrating experience, but it is also hard to get a professional finished look. 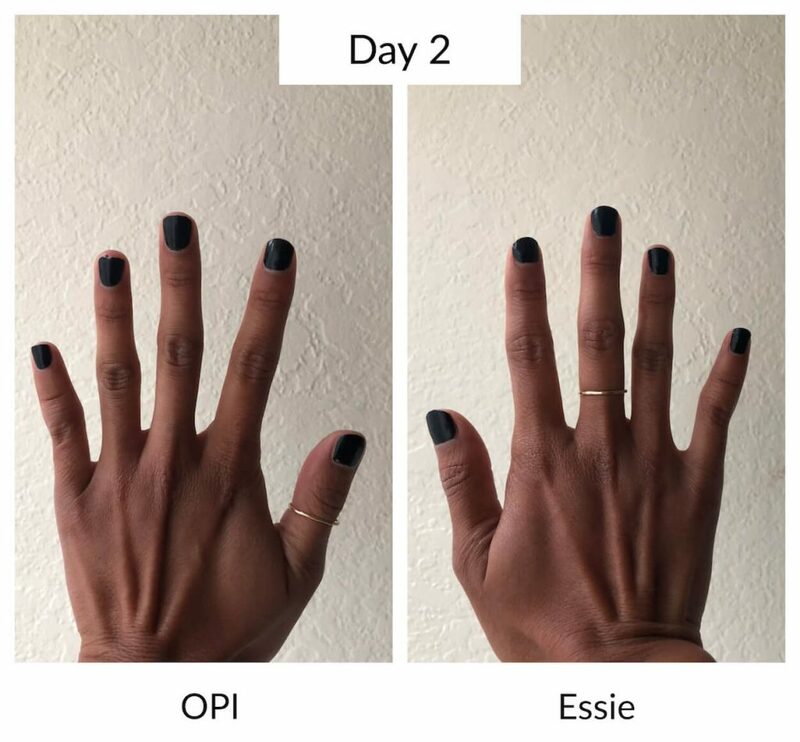 To evaluate the ease of application for Essie and OPI polishes, we applied each polish and noted how ergonomic the applicator handle felt as well as how well the brush actually applied the polish to the nail. The OPI handle with its non-slippery, matte finish and tapered shape felt much nicer in our hand than the slippery, smooth finish and straight handle of the Essie brush. Something about the Essie version just felt flimsy to us. When it came to actually applying the polish, OPI again stood out. We found that the flat, wide OPI brush made it easy to apply an even, smooth coat of polish in the standard 3 stroke application method used by salon professionals. We tried the same technique with Essie, but the round, thin brush did not cooperate and instead we found ourselves having to use many brush strokes to attempt to replicate the quality of the OPI application. No matter how great your nail polish looks when first applied, if it doesn’t last a reasonable amount of time, it hardly seems worth the cost and effort. 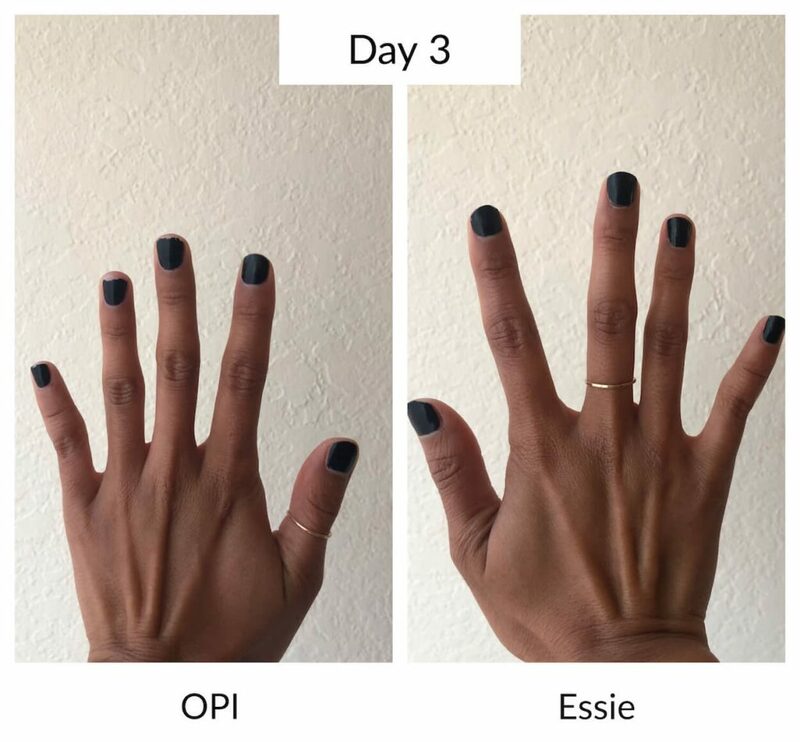 To compare the longevity of Essie and OPI nail polishes, we applied 2 coats of Essie nail polish to the left hand of our model and 2 coats of OPI to the right. Since we didn’t want our results to be impacted by external factors, we decided to forgo base coats and top coats. Our model wore the polishes for 5 days while being sure to consistently handle common objects with both hands throughout the day to evenly test the durability of both brands. 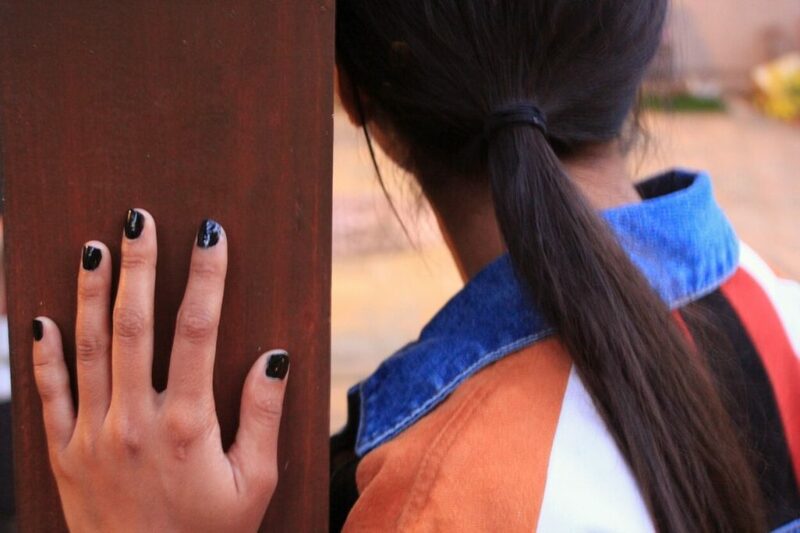 We took photos of her hands at the end of each day and compared the results. Day 2: The Essie manicure had a slight dent in the polish on one finger. OPI had chipping starting on the tip of one finger and the base of another. Day 3: Essie had an additional small chip on one finger. OPI now had chips on 3 fingers. Day 4: Essie and OPI both had chips on all 5 fingers. Day 5: Essie and OPI both had chips on all 5 fingers. While both Essie and OPI ended up with chips on all 5 fingers by day 4, the Essie chips were not quite as large as the OPI ones. Essie also didn’t feel like it chipped quite as easily as OPI did. Where OPI really stood out was in safer ingredients and ease of application. For those reasons, we chose OPI as the best nail polish brand. Both Essie and OPI polishes have their merits. 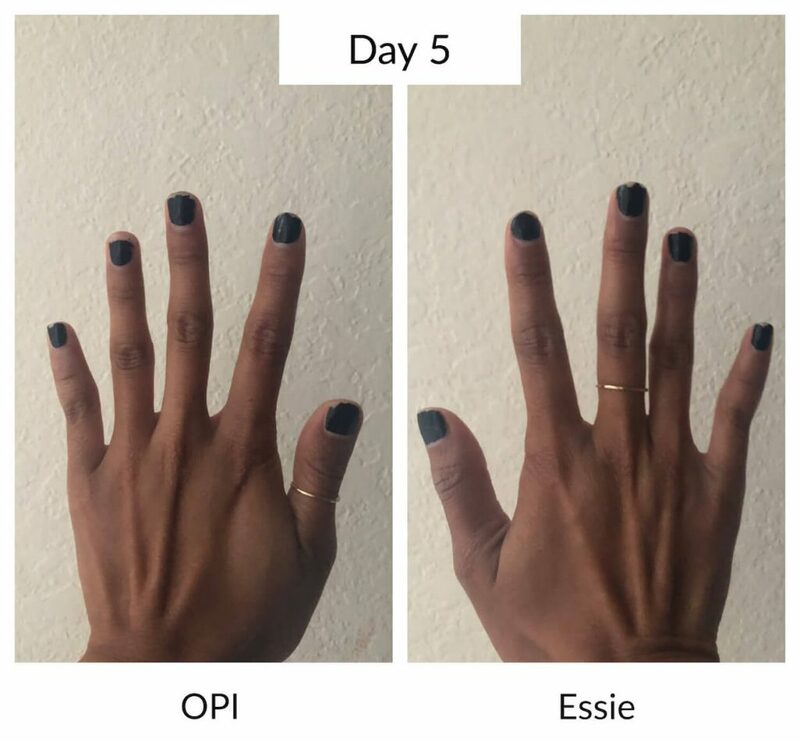 Essie performed slightly better than OPI in the longevity test and it is similar in price and visual appearance. Nail preparation is everything; polish doesn’t adhere well to nails that have ridges or are covered in remnants of old polish. Before you even break out your polish, take the time to properly prepare your nails. To smooth out ridges, run a buffing block over the nail bed. A four-sided buffing block is perfect for not only getting rid of ridges, but also for eliminating stains caused by wearing dark polish without a base coat. Finish up with the finest side of the block to leave your nails with a smooth surface. Finally, use nail polish remover on each nail to remove any residual polish, lotion, or body oils that can interfere with the successful application of new polish. We have all skipped, or at least been tempted to skip, a base coat when doing a DIY manicure, but there is a reason the professionals always take the time for this step. It fills in any irregularities left on the nail and creates a nice even surface for the polish to adhere to. If you skip it, your polish won’t go on as smoothly and evenly or hold up as well. There is a reason it takes over an hour to get a salon manicure. Professionals make sure each coat of polish is completely dry before applying another layer. If you want your at home polish to hold up as well as a salon version, follow the pros’ lead and be sure to allow plenty of drying time between coats. Speaking of multiple coats, once your base coat is dry, you should be applying your polish in two thin coats with plenty of drying time in between. While you may be tempted to do one thicker coat and save time, this will make your polish much more likely to peel or chip than if you take the time to do it right. Just as with the base coat, a top coat is a crucial step in a long-lasting manicure. It is a protective layer that keeps the underlying polish from getting damaged. Add a top coat once your second coat of polish is dry. To extend the life of your manicure even longer, add a second top coat a few days later. As you apply the base coat, polish, and top coat, be sure to apply the products not only to the nail surface itself, but also just over the tip of the nail onto the raw edge which you buffed/filed. This seals the nail, helping to keep water from creeping in and causing premature chipping. When choosing a nail polish, it is important to find a product that is made with safe ingredients while being easy to apply and long lasting. You get the best results when you follow professional preparation and application methods. There are many choices for nail polishes, however when we did a side-by-side comparison of two of the leading brands – Essie vs OPI – OPI was the winner. OPI has fewer potentially harmful ingredients than Essie and its larger handle and brush make it easier to apply. 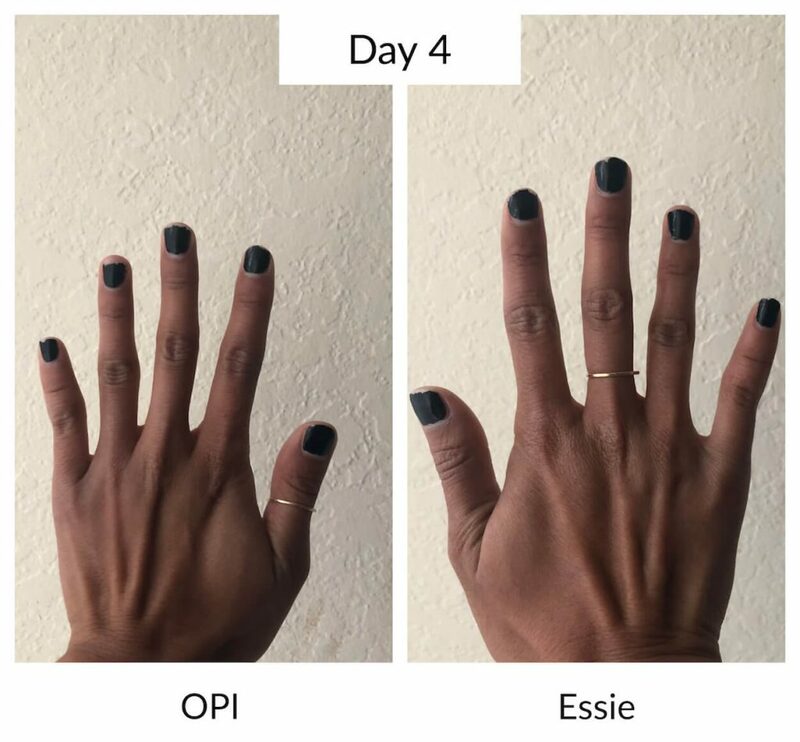 While Essie polish performed slightly better in the longevity test, following our tips for making nail polish last longer is all but guaranteed to make your OPI manicure hold up until you are ready to swap it out for another of OPI’s over 240 stunning shades. Product Playoffs was made to help you find the best products through in-depth, unbiased, and transparent reviews. We take the top products and test them against each other to help you make the best purchasing decision possible. Disclaimer: We may earn an affiliate commission when you buy through our links. Learn more about us and why we provide the best product comparisons. Join our newsletter to stay updated on the best products!